Get your own owl booklet! The Share-Net booklet, A Beginner’s Guide: Owls, containing information on all 12 species of South African owls, is available from the Centre for R20.00 (plus R5.00 for packing and posting), or from Share-Net (http://wessa.org./sharenet.asp). 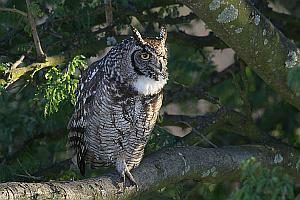 Attracting owls to an area is not as easy as attracting other birds as they won’t come down to feeding tables – and keeping them supplied with mice and other live food would be impossible anyway. Keeping the area as natural as possible – and avoiding poisons of all kinds – will allow a healthy population of natural prey to develop. 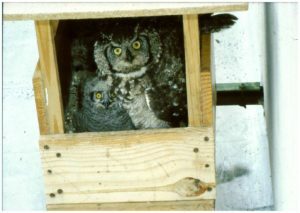 One can provide safe nesting in the form of nest boxes. This could encourage owls to breed, or if they are breeding in the area, could improve their breeding success. At Delta Park, a pair of Spotted Eagle Owls only raised one chick in nine years as a result of inadequate natural nesting sites. Once a nest box was provided their success improved to 32 chicks in the next 11 years. 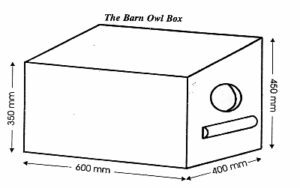 Designs for the nest boxes for both the Spotted Eagle Owl and Barn Owl are shown below. The spotted Eagle Owl box is a simple tray of the size shown. It should be securely anchored to a horizontal branch of a tree as high above ground as possible. Ideally the box should be shielded from rain and excessive sun by the trunk and foliage. If the site is very exposed, however, it may be advisable to fit a roof. This can be done quite easily by fitting roof support pillars of 4.5 cm X 4,5 cm timber, 400 mm long, to the inside of the box. The roof is then fitted by screwing through it into the pillars. Weatherproof the box thoroughly with a non-toxic material and put a layer of clean river sand about 10 cm thick in the box. Barn Owls prefer darker, more hidden nest sites and therefore need a closed box. This should be placed high up in a tree (6 metres) and again the box should be shielded by the trunk and foliage. If your carpentry skills are good enough, it is also a good idea to have a slight slope to the roof so that rainwater does not lie on the roof but runs off quickly. It is not necessary to put anything into the box as the owls will lay their eggs on the layer of pellets that collect on the bottom of the box. In a manner of speaking, well-known bird expert Geoff Lockwood is “part of the furniture” at Delta Environmental Centre. Living on the Centre’s premises in Delta Park, for the last 28 years, he has been involved in the development of Delta Centre since its inception. He focuses mainly on environmental education programmes. He has a soft spot for children and enjoys working with them – awakening their interest in the value of the natural environment and the wise use of sustainable resources. He is also involved in staff training, including aspects relating to birds in the park into his courses. In an effort to bring the environment to the disabled, he has embarked on a special programme where he acts as facilitator to help people interpret their environment. Recordings of bird-song as well as stuffed specimens of birds found in the park form part of this programme, which complements the Sasol Sensory Trail for the physically challenged. Geoff has been running bird programmes in the Park, even before the Centre was established. He is very involved in leading bird-watching tours to various parts of southern Africa, Malawi and Israel, and is a popular lecturer on all topics relating to the natural environment. He is a lecturer and course leader for organisations such as BirdLife South Africa, Sappi Brett and Vent tours. Owls have a special place in his heart, and a highlight of the past 24 years has been the pair of spotted eagle owls which has bred most years in a box which he erected for them on the roof of Delta Environmental Centre. A missing element for the owls in the park was the presence of a safe nest site and by providing the box, spectacularly improved their breeding success. In order to counter the negative sentiments towards owls due to fear, ignorance or misunderstanding, the Centre has offered successful environmental education programmes on owls for many years. Geoff was born, raised and educated in Johannesburg. His early interest in all things natural became progressively more focused towards birds, these being the most accessible and visually interesting form of wildlife to a young city kid. In 1971 he met bird artist Simon Calburn and began exploring bird painting as a way of expressing the pleasure birds gave him. In 1973, whilst studying for a BSc degree in Zoology/Geology at the University of the Witwatersrand, he decided to go full-time into bird painting. Various solo and group exhibitions followed in Johannesburg, Seychelles, Plettenberg Bay and Pretoria. In 1981, he wrote, illustrated and published the popular book, Garden Birds of Southern Africa. Three years later he undertook the mammoth task of contributing half the illustrations for Robert’s Birds of Southern Africa – 5th Edition, and in 1992 he completed 10 revision and new plates for the sixth edition of this work, published early in 1993.